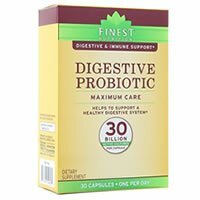 Overall, at 2.5 out of 5 stars, Finest Nutrition Digestive Probiotic Maximum Care is an average probiotic. This probiotic is easy to use, which I appreciate. You only have to take 1 capsule daily. If you have trouble swallowing capsules, you can open them up and sprinkle contents into a cold drink or cold food. You also don’t have to refrigerate this probiotic, which makes it super convenient. The capsules come in a handy blister pack that can go with you when you’re on the go. This probiotic also has a great 100% satisfaction guarantee. The capsules are on the larger size. I didn’t personally have a problem getting them down but others may have some trouble with it. The probiotic cells are also only guaranteed at the time of manufacture. I like it better when they can guarantee you all the way to the expiration date. This probiotic is also not safe for kids, which is a bummer. Last but not least, this probiotic is definitely not intended for daily use. With 30 billion cells and 10 probiotic strains, it begins to go overboard. When a probiotic reaches 10+ probiotic strains, they actually begin to compete with each other and can even cancel one another out (we don’t want this). Overall, at 2.5 out of 5 stars, Finest Nutrition Digestive Probiotic Maximum Care is an average probiotic because it’s convenient, easy to use, and has a great satisfaction guarantee but it’s not safe for kids, the capsules are larger, and the strain count goes a little overboard. Finest Nutrition Digestive Probiotic Maximum Care has 30 billion cells that come in 10 probiotic strains. This strain has been extensively researched compared to other strains and has been shown to help with several areas. Lactobacillus acidophilus has been shown to potentially help alleviate Irritable Bowel Syndrome (IBS), gas, constipation, and bloating. It may also help treat vaginal infections, asthma, lactose intolerance, and high blood pressure. Bifidobacterium longum has been researched to show potential anti-inflammatory properties. This anti-inflammatory affect may help improve the immune system. This strain has also been studied to show possibly help with diarrhea related to antibiotic use, lowering high cholesterol, seasonal allergies, and weight loss. One thing to take note of is that 30 billion cells are far too many for a daily probiotic. Also, 10 probiotic strains is also beginning to push the limit because once a product uses 10+ strains, they actually begin to compete with each other and may cancel one another out. Finest Nutrition Digestive Probiotic is allergy friendly. The capsules are free of all major allergens. There’s NO lactose, soy, or gluten. The other ingredients included are: cellulose, magnesium stearate (vegetable source), silicon dioxide, and titanium dioxide. For 30 capsules, lasting 1 month, it costs $20.99. This works out to be $0.69 a day to take this probiotic. 70 cents a day for this probiotic is a good price and value for what you’re getting. No belly pain or cramps, so I was happy about that! However, 30 billion cells with 10 different strains is definitely more potent and powerful. If you have a sensitive stomach or don’t necessarily have a special ailment, maybe steer clear of this probiotic. Walgreens offers a wonderful 100% satisfaction guarantee on all of their Walgreens brand products. If you’re not 100% satisfied with the probiotic, just return the unused portion and they will give you a full refund, plus any shipping that you paid for. This is a fantastic guarantee, props to Walgreens! To buy Finest Nutrition Digestive Probiotic Maximum Care, click here. Allergy Concerns No major allergy concerns… free of lactose, gluten, and soy. Side Effects I didn’t see any side effects while taking this probiotic. Guarantee Yes, 100% money back guarantee for this product, shipping included.